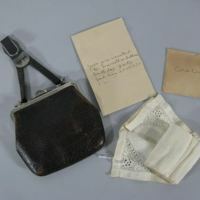 A black child's purse from the late nineteenth century containing a child's handkerchief and birthday party invitation. The invitation is for a birthday party for Marcella Sullivan and is addressed to Cora Edwards. The party is for May 20th, at 3:30. From the Estate of Mrs. Eva Edwards Frye. Donated by Pearl D. McAuslin. 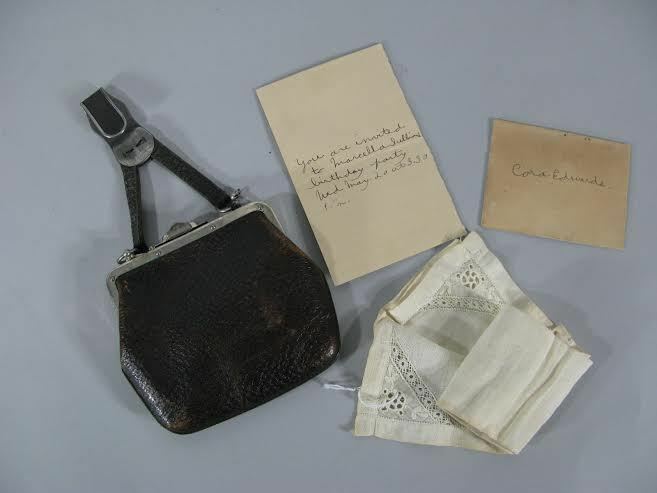 “Child's Purse with Handkerchief & Birthday Party Invitation,” Maynard Historical Society Archives, accessed April 25, 2019, http://collection.maynardhistory.org/items/show/3499.